While browsing that same Wal-Mart in which I saw the Indonesian flick Merantau sitting on the shelf, I noticed that Disciples of the 36th Chamber had been released on US DVD. Unlike their DVD releases of Return to the 36th Chamber and Return of the One Armed Swordsman, which quoted my reviews by name and as “LoveHKFilm.com,” Dragon Dynasty chose not to utlilize my review for their back cover art and website link. That’s probably because I hated it. I mean, can you imagine picking up a DVD and seeing these quotes? I don’t think that would help sell more copies. As a side note, I remember contemplating buying a copy of Ong Bak in Singapore, and the one I picked up — purportedly a Mainland Chinese DVD, I think — had pull quotes from a BAD review of Iron Man on the back cover! It said something disparaging about Jon Favreau. Poor guy. I wasn’t planning on running three retro reviews in a row this week, but I’ve been pretty busy with my dissertation work, and since I’d already started with The 36th Chamber of Shaolin yesterday, I figured I might as well continue spotlighting the second and third entries in the series for today’s post and tomorrow’s follow-up. This winning, but entirely unconventional sequel recasts the first film’s star, Gordon Liu, as a down-on-his-luck con artist learning the ropes from the very same character he played in the original movie: the venerable Shaolin monk San Te. That may sound confusing, but the role switcheroo actually turns out to actually be a casting masterstroke as it successfully solves the problem of trying to follow up a film like The 36th Chamber of Shaolin, which has a beginning, middle, and end to San Te’s arc with very little room for a sequel. By having Gordon Liu play a different character, one gets to a) experience the “journey”all over again in a way that wouldn’t make sense using the same character or a different actor as the rascally pupil. Equal parts spoof and straight-ahead martial arts actioner, Return to the 36th Chamber is one of the rare sequels that’s just as much fun as its predecessor. I used to collect action figures, but I honestly cannot remember the last time I bought one. Now, don’t get me wrong, my lack of toy purchases has little to do with “maturity,” and more to do with the need to conserve personal finances. Oddly enough, collecting toys has become an oddly expensive proposition. Not only is the collector-centered “cool stuff” usually higher-priced, but even the mass-produced products that are actually intended for kids has increased considerably in the last few years. Yesterday, I saw that Target was selling DC Comics’ JLU line for $8.99.In fact, suggested retail price on these figures — no bigger than four inches tall — is $9.99. That’s highway robbery, if I ever saw it. However, just because I’m abstaining from frivolous purchases like these, that doesn’t mean I can’t appreciate them. 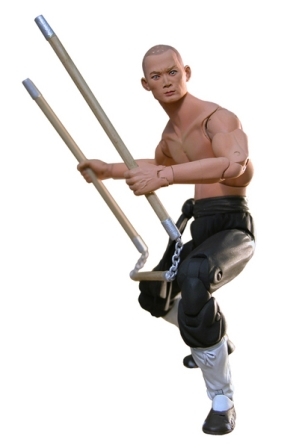 In fact, just recently I was browsing the online toy retailer, Big Bad Toy Store, and lo and behold, I discovered an interesting shipment for June 2010 — Shaw Brothers Action Figures! The quote is pulled from my positive review of the 1980 Lau Kar-Leung-directed classic. To my knowledge, I’ve only ever been quoted by name once before — on the packaging of Optimum Releasing’s Swordsman 2 DVD in the UK — so it was nice to actually have a DVD that I could point out at Best Buy to my friends and family. Let’s just say it made my day. Now does Roger Ebert track every time he’s been quoted in print advertisement or DVD boxart? Probably not. But I’m no Roger Ebert. So if any you folks out there see pull quotes attributed to LoveHKFilm.com – or more specifically, quotes from Kozo, Kevin, or me — please let us know. My picks for the Top Ten Hong Kong Films of the 90s, a LoveHKFilm.com Time Machine review, and my thoughts on such semi-recent fare as Storm Warriors, Accident, and Vengeance — unless I keep playing Yakuza 3 into the wee hours of the night, then all bets are off.